Today, it turns out, is National Comic Book Day (not to be confused with Free Comic Book Day, as noted in the CBR write-up). 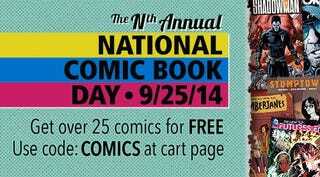 Comixology is offering 25 comics for free (make sure to put in the code before going to checkout). It's mostly smaller publisher stuff, and just issue #1 to try and get you hooked, but if it turns out to be a good issue #1, then I'm all for buying more to find out what happens next. I ended up getting all the Valiant titles since I used to read them back in the 90s (even have a Shadowman t-shirt from back then, somewhere) and am interested to see what they're doing with those characters now. Enjoy, and happy comic book day! ETA: the free comics I've "purchased" (all the Valiants, Ragnarok, and Princess Ugg, Hactivist also all have DRM free back-ups available, as part of that new program.